The closer we get to the 2016 Summer Olympics in Rio, the more we realize the extent of the problems that still lie ahead. Given all of these issues, there is a chance that the Rio Olympics turn out to be anything but a good time. The Olympics themselves are not the only thing heading in that direction. In all seriousness, we have no idea what this means. When did Team USA basketball turn into the No Fun League? This is a group consisting of some of the best players on the planet, and the plan is for them to dominate. Yet, at the end of the day, they are not supposed to enjoy doing it? There are already enough issues going on in Rio, let’s not turn this squad into another one. In fact, the way we see it, this team should go out of its way to have more fun. 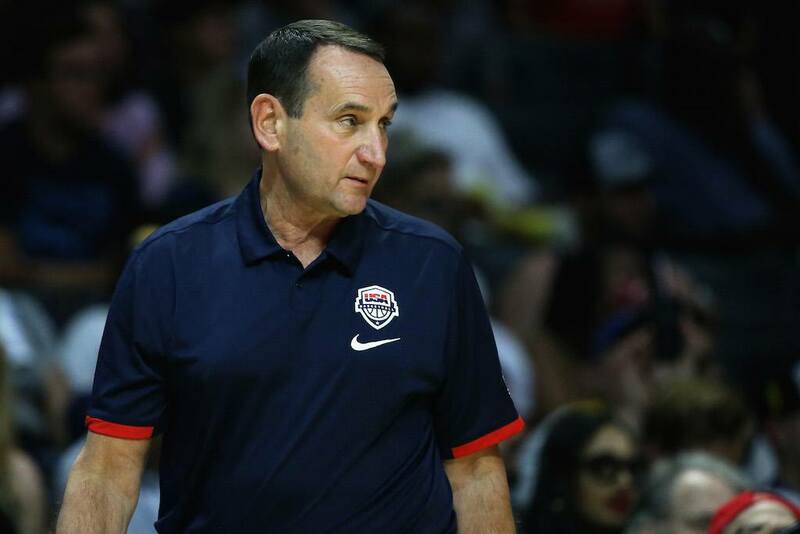 Here are five reasons why Coach K should let them. 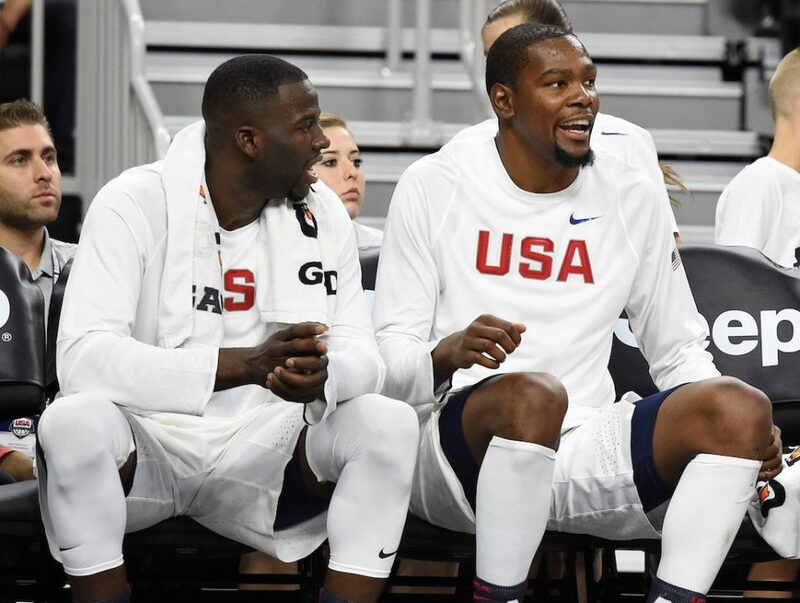 Given that Team USA’s roster is made up of some of the biggest names in the NBA, it’s hardly a surprise that this group is the heavy favorite to take home the gold at the Rio Games. However, if you peruse over the list of players, you’ll see that only two members of the squad — Carmelo Anthony and Kevin Durant — have previous Olympic experience. While some may feel like this “inexperience” is reason enough to “tone things down,” we actually feel the complete opposite. Having the opportunity to suit up for one’s country at the Olympics is a once-in-a-lifetime experience; we know this and we know it’s not something to take lightly. Yet, for 10 of these Team USA members, this is the first time they’ll ever don the red, white, and blue on the Olympic stage — and that’s something to cherish. You only to experience your first time once; don’t forget to enjoy it. Through the first three exhibition games, the bigs on Team USA have been absolutely dominant — and that should scare the rest of the competition. Big time. In USA’s recent 107-57 shellacking of China, the team, led by DeMarcus Cousins (11 rebounds), Draymond Green (seven rebounds), and DeAndre Jordan (five rebounds), pulled down a ridiculous 48 boards, out-rebounding its opponent by 27 rebounds. 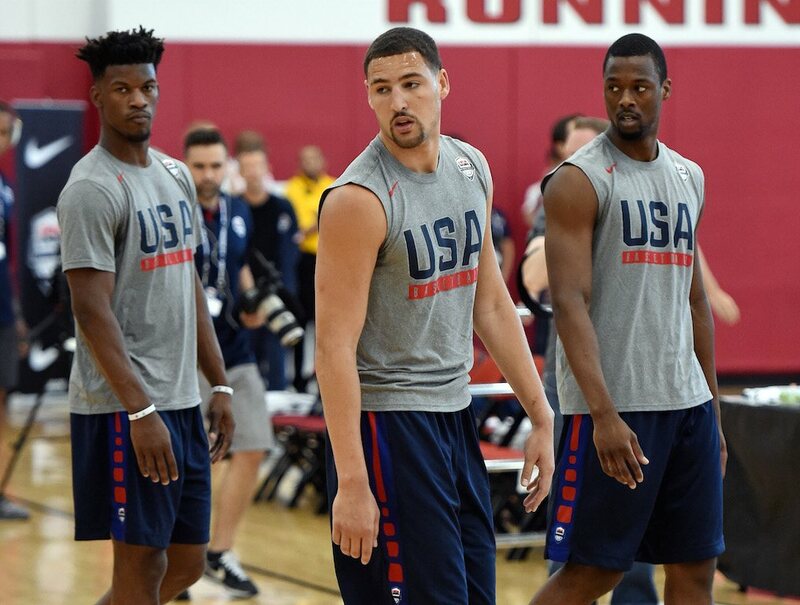 We haven’t seen a Team USA play with this sort of size in quite some time, and we believe a lot of this group’s success has to do with how loose the frontcourt appears on the floor. It might be wise to keep this up. Why mess with a good thing? When he finally decides to call it a career, Carmelo Anthony will go down as one of the greatest scorers in NBA history. The guy just has a knack for putting the ball in the bucket. Yet, while his success as an individual is undeniable, the same cannot be said from a team perspective. It is with Team USA that he gets to change that. Melo may be lethal in the National Basketball Association, but he was born for the international competition. As a member of team USA, Anthony gets to showcase his immense talent and win in the process. 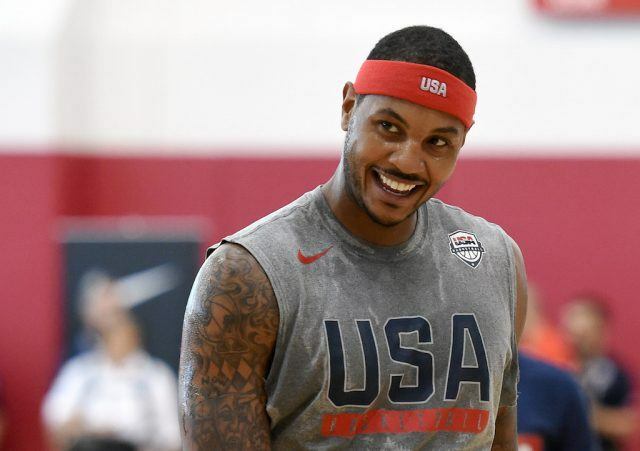 Now getting set to play in his fourth Olympic Games, Melo looks to keep the good times rolling. Eventually he will have to return to the New York Knicks, a club that will be average at best in 2016–17 and is unfortunately owned by this guy; fun time will be over. Please, don’t take this away from him. He needs it more than most. I wrote it on my shoes during the playoffs. Sometimes I’m on the free throw line and I look down and I remind myself because I may get too tense or too upset or too angry at something. I just got to realize why I play this game and it’s because I love it and I want to have fun. We’ve seen some amazing dunks in our time, yet nothing has quite lived up to the moment when Vince Carter jumped over a 7-footer. Then DeMar DeRozan almost threw down this insane 360 slam, and we started to think about what could go down in Rio. And we couldn’t contain our excitement. Statistics and information courtesy of ESPN.com, Fox Sports, and USA Basketball.